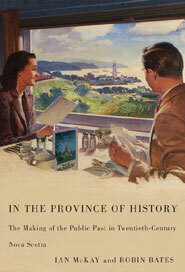 Ian McKay and Robin Bates, In the Province of History: The Making of the Public Past in Twentieth Century Nova Scotia, (Montreal and Kingston: McGill-Queens University Press, 2010), Soft Cover, 481 pp. Nova Scotia is known far and wide as “Canada’s Ocean Playground.” It’s emblazoned on the province’s licence plates, evoked in dreamy television commercials and trumpeted in colourful tourist guides. That popular image also comes packaged with an accessible, entertaining history for the consumption of tourists. Scottish regalia, sourdough fishermen, sou’wester hats, rugged seascapes, Cape Breton fiddlers and the odd Acadian pastoral scene still populate the public, tourist-oriented version of Nova Scotia’s past. And these very images and symbols can be traced back to the 1930s when the province began developing its tourist promotion business. Taking their cue from a rather hokey 1936 composite photograph, entitled Native Types, and intended to promote Nova Scotia tourism, Ian McKay and Robin Bates’s controversial new book, In the Province of History, contends that this iconology rests on an invented, largely fictional, historical tradition developed for the purpose of selling Nova Scotia to visitors. In the book, the authors demonstrate how the province’s public past was reconstructed and then turned into a marketable commodity. The book is an impressive, if rather daunting, academic work, six years in the making, and it takes on the sacred cows of the Nova Scotian popular tradition. Back in 1992, McKay fired his first salvo at “Tartanism” or Nova Scotia’s supposed “Scottishness” in the regional academic journal Acadiensis, and he followed in 1994 with Quest of the Folk, a searing look at the cultural contradictions embedded in popular folk culture. He returns to the field with researcher Robin Bates to deliver a full-blown critique of Nova Scotia’s tourism-driven public history. McKay and Bates contend that Nova Scotia’s popular history has been spun as “a story of progress, growth and liberty.” In this “liberal order” interpretation, the province’s narrative history is presented and misrepresented to attract visitors in ways that highlight its “whiteness” and exclude aboriginals, ethnic minorities, women, and ordinary working people. Nova Scotia’s public past, McKay and Bates argue, propagates pride in heritage, but blurs the distinctions between fact and fantasy and perpetuates a safe, stereotypical, romantic history. In the end, the province of history is really just the heritage promotion business and it is driven, like almost everything else, by the desire for profits. The authors clearly relish taking on Nova Scotia’s recognized folk heroes and political titans. Longfellow is excoriated for his 1847 poem Evangeline, a popular tourist item which dramatizes the brutal British expulsion of Acadians from Nova Scotia. The revered former lion of Nova Scotia popular writing, Thomas Raddall, comes in for sharp, precise criticism as a Britannic popularizer with a penchant for literature sprinkled with crude racial and gender-based stereotypes. Premier Angus L. Macdonald is singled out as the leading purveyor of “Tartanism” who left a lasting legacy of parsimonious Highlander politics rooted in “mystic racialization” of Gaelic culture. Much less convincing is the authors’ attempt to lump together Nova Scotia’s leading public intellectuals and political figures as defenders of the emerging liberal order. Popular Amherst-born writer Will Bird, author of the incomparable Ghosts Have Warm Hands, would have been most uncomfortable being paired with the thoroughly British and patrician Raddall. If, as McKay and Bates insist, Angus L. was so obsessed with promoting “Tartanism,” one might have expected more reference to it in Stephen Henderson’s recent 2007 biography of the man. It’s also quite a stretch to imagine Liberals and Tories, or Protestants and Catholics, conspiring together when their shared history was so bitterly contested for much of the 20th century. McKay and Bates’s In the Province of History is a profoundly important book, irrespective of its periodic excesses. The lead author is a formidable Canadian academic, a respected former editor of New Maritimes magazine, and now an influential historian based at Queen’s University. Much of what passes for Nova Scotia’s public history remains mired in touristy imagery and sentimentality. Historians like McKay and Bates who are genuine critical thinkers are effective in exposing fabrications and provoking much-needed rethinking. After all, many of us do cringe at the sight of Nova Scotia premiers playing the fiddle, see fissures in Nova Scotian society, and prefer to keep those provincial tartan ties safely in our closets. The authors have produced a weighty volume that deserves to be taken seriously here in Nova Scotia. If the province’s tourism promoters ever discover McKay and Bates’s book, look out for big changes. Doers and dreamers frolicking on the scenic coastline of Canada’s ocean playground would certainly disappear, and perhaps the provincial guide book would be supplanted by a new version entitled Unsung Heroines and Ordinary Working Folk. Dr. Paul W. Bennett is Director of Schoolhouse Consulting, Halifax, author of The Grammar School: Striving for Excellence in a Public School World (Formac, 2009), and blogs regularly on Educhatter. Reprinted with author’s permission from The Sunday Halifax Herald, Sun, Jul 25, 2010. What’s never acknowledged when academics and others discuss Nova Scotia’s “taratanism” is how little actual Gaelic culture there is in this representation. It’s all dervied from the imagination of English-speakers. Some of the decision makers may have a Mc or a Mac as part of their surnames but they’re as Anglo as can be, and had little interest in developing or sustaining Gaelic speaking communities in Nova Scotia. Given that Rodney MacDonald is an actual Gael and fiddler why was his playing and promoting his cultural heritage cringe-worthy? Was it equally cringe-worthy to see Bill Clinton play the saxophone on Arsenio Hall? Ken MacPhail is entirely correct here, and it’s discouraging that even seasoned academics like McKay can’t tell the difference between actual Gaelic culture and the stereotypes and cliches created by anglophones about it.